SANDRA: You have a master’s degree in Chemical Engineering and Real Estate Finance. What made you choose a career in the property sector? LANRE: At school, my though process had always been geared towards the sciences and studying engineering at university was a natural step. After university, I began a career in structured finance, where the training I received as an engineer was very useful. My family is in the real estate business in Nigeria and I had always retained an interest in the sector. Therefore, I took the step to specialise in real estate finance where I could combine my financing background with my interest in real estate. SANDRA: What made you interested in Shopping Centre Investment? LANRE: The retail sector in Sub-Saharan Africa and in Nigeria is incredibly dynamic – demographic and economic factors mean that it has a great deal of potential. It is also the first part of the Nigerian real estate sector in which there was offshore institutional investment. This is what attracted me to the sector in the first place. I also wrote my MPhil dissertation on the determinants of shopping centre rents in South African metropolitan areas. So I could not miss the opportunity to work with the leading indigenous developer of commercial real estate in Nigeria. SANDRA: You are the C0O at ARIA, an asset management arm for Commercial Retail Properties of the Persianas Group. What do you enjoy the most about your current position? 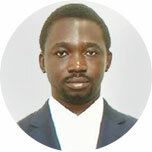 LANRE: I enjoy the actual process of growing the business and working to develop the formal retail market in Nigeria. At a high level it is about providing a pathway for bringing in the required investment to grow the retail sector which is a critical and growing part of the economy. At a more granular level, it is about the business of working with our tenants to position them for this opportunity. While we have foreign owners of global brands as tenants; I am also keen to ensure that local Nigerian retailers can grow and eventually compete on the continent and eventually globally. SANDRA: The retail sector in Africa has become a major focus for development activity. In your opinion, what are the most promising countries? LANRE: This is hard to say, there is a huge deal of promise across the board. In addition, while some countries have more “potential” in terms of sheer market size, others are much more easy to do business in. Overall, excluding Northern Africa, I would pick Nigeria, South Africa, Mauritius, Botswana and Ghana as bright spots. SANDRA: You were working as an Associate at Goldman Sachs in London when you decided to come back to Nigeria to work as a special adviser to the minister of Finance. What triggered this decision? LANRE: I always knew I was bound to come back to Nigeria, it was a question of timing. This feeling was because I believed that Nigeria would need all the help it could get and that meant that anyone that can contribute to its development should do so. The role in the Ministry of Finance allowed me to put the skills I had learnt during my time in the City to the service of my country; it was a difficult offer to refuse. SANDRA: You have both attended and presented at the Shopping Centre Investment course. Who would you recommend it to? LANRE: There is a usual target audience for this course from asset managers to investors. However, I would particularly recommend this course to shopping centre owners (or potential owners) i.e. indigenous entrepreneurs and local institutional investors (such as pension funds) – a better understanding of the investment and management process will lead to increased investment in the area.